Is your seasonal flu not quite seasonal enough for you? Don’t worry, CVS has you covered. CVS has a history of lozenge-related flavor innovation, having introduced root beer and fruit punch lozenges to the market, but those apparently didn’t push the envelope enough. In late summer 2017, the pharmacy chain took a trendy turn, debuting limited edition Pumpkin Spice cough drops under its own CVS Health label. When the combination of pumpkin and menthol hits your mouth, or what CVS refers to as “soothing relief,” you’ll probably be glad that your sinus congestion is dulling your sense of taste. If you were one of the tens of people who were disappointed when those autumnal lozenges disappeared from store shelves around January or so, CVS took to its Twitter account in September 2018 to assure customers that pumpkin spice cough drops were back. They appear to be good (well, unexpired) through summer of 2019, so aficionados can stock up for any coughing bouts they anticipate falling outside of the season for these things. CVS appears to have a bit of a pumpkin spice fixation, encouraging its Twitter followers to “Celebrate with your favorite fall flavor,” which is apparently only allowed to be pumpkin spice, though its cough drops didn’t make the cut for the video of pumpkin spice products available in its stores (we wonder why?). 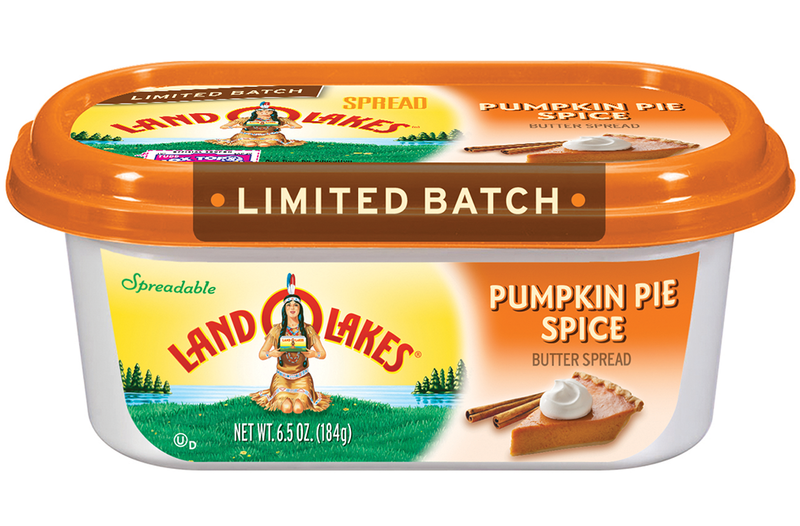 Land O’ Lakes is awfully excited about its seasonal offering, gushing, “Finally, pumpkin pie spice exactly where it belongs… in spreadable butter! Fall never tasted so good.” Setting aside the questionable claim that spreadable butter is the ideal vehicle for pumpkin pie spice delivery, we think fall has probably tasted at least as good before this product hit the shelves. And you thought butter was one of those things that didn’t really have a season. The folks at Land O’ Lakes tell us that this will be “perfect slathered on seasonal breads, muffins or pancakes, stirred into savory sauces or whipped into thick, sweet frostings.” We’ll give you the frosting, Land O’Lakes, but it’s unclear how seasonal baked goods really need to be made more seasonal by being swathed in special butter, or what kind of “savory sauces,” exactly, would benefit from the addition of sweetened pumpkin spice butter. This entry provides the best evidence that the pumpkin spice invasion is a slippery slope. First, there was pumpkin spice cream cheese, because if Land O’ Lakes has taught us anything, it’s that one seasonal product–say, a pumpkin spice bagel–must be slathered with another seasonal product to really amp up the autumnal vibes. But when the introduction of pumpkin spice cream cheese doesn’t alarm the general public, it emboldens the next wave of pumpkin spice cheese products, including pumpkin spice goat cheese and pumpkin spice gouda. The makers of the goat cheese encourage you to “Try it with a local craft beer!” and Beemster, which makes the gouda, suggests that it pairs with Malbec, Chardonnay, farmhouse ale, and cider. At least we’re in agreement that you’re going to probably want some alcohol (ok, a lot of alcohol) if your cheese has fallen victim to the pumpkin spice craze. Beemster also tells us to “Just imagine it with butternut squash mac-n-cheese!” We’d rather not, Beemster. The words “pumpkin spice mac-n-cheese” are going to haunt our dreams as it is. Perhaps in a sign of hope for humanity, most of the pumpkin spice chips we investigated have disappeared from the market. We don’t think too many people are mourning the loss of Pumpkin Pie Spice Pringles, which, as one Amazon reviewer put it, “Made me hate pumpkin flavored stuff.” Likewise, Food Should Taste Good discontinued its Harvest Pumpkin Tortilla Chips, avoiding the obvious rationale that when your name is Food Should Taste Good, maybe sugar and spice pumpkin tortilla chips aren’t really a fit with your brand promise. The company instead explained that “trimming down our product offerings means we’re able to focus on making other delicious, high-quality flavors.” The company said it has no plans to bring back the retired flavor, but threatened, “you never know what the future might hold!” Sadly, we fear that the future holds more weird pumpkin spice stuff. For those who just can’t live without pumpkin spice chips, there are some other options. Terra offers “Pumpkin Spice Sweets,” which are actually sweet potato chips coated in cinnamon and nutmeg. Trader Joe’s pumpkin tortilla chips, which the retailer suggests pair well with its Fall Harvest Salsa, Pumpkin Cream Cheese, or Pumpkin Greek Yogurt (because once you’re eating pumpkin spice chips, apparently anything goes), actually contain pumpkin and “a kick of cinnamon & nutmeg to amplify their prodigious Pumpkin Season Profile.” More evidence of the slippery slope of Pumpkin Spice incursion comes in the form of pumpkin spice kale chips, which the manufacturer offers year-round due to “great demand.” We’ll believe it when we see anyone downing those things like… well, regular, non-pumpkin spice, non-kale chips. Maybe you thought the deli counter was safe from pumpkin spice. And for a while, it was. Then came 2016, and Hannaford introduced sliced-to-order pumpkin spice smoked hamunder its “Taste of Inspirations” label. Unfortunately, the “inspiration” behind this product proved contagious. 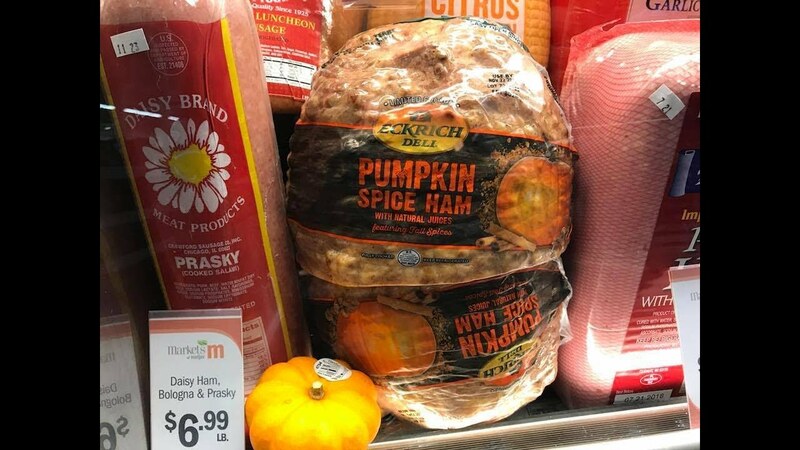 In 2017, Eckrich introduced a competing pumpkin spice ham, asking “Ready to fall in love with a new deli favorite?” Um, if that “ new deli favorite” involves pumpkin-flavored ham, count us out, thanks. Once pumpkin spice gains a foothold on meat, it’s going to be hard to stop. We are actually kind of curious about H-E-B’s pumpkin spice bacon (aka: “Hayride Bacon”), though reviews are mixed, ranging from “It’s kind of disgusting” to “I love fall and I love bacon. Win-win in my book.” But pumpkin spice in our beef chili, chicken sausage, or bratwurst (which is described as tasting like “a pumpkin pie in bratwurst minus the whipped cream”)? That is a bridge too far, pumpkin spice. Too. Far. You know that feeling when you’re polishing up your car’s exterior, trim, and wheels after a wash and you’re thinking, “Wow, my car looks great… but I wish its now-sparkling exterior smelled more… seasonally appropriate”? What? You don’t know that feeling?! 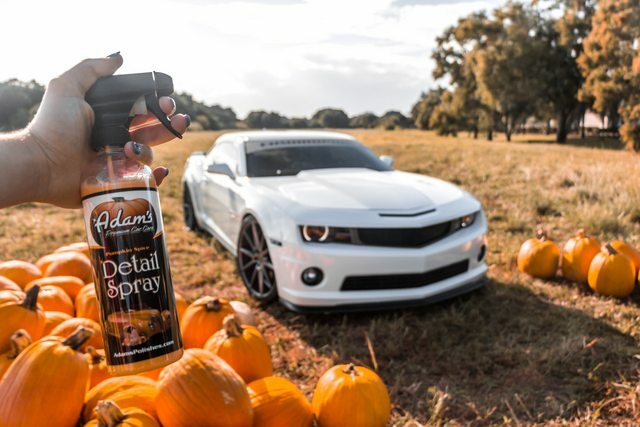 Well, someone apparently does, because the good folks at Adam’s Polishes have been offering their Pumpkin Spice Detail Spray since 2015. Their website details the company’s embrace of fall, noting, “We hope when you receive your bottle you can embrace the season too… all while having the shiniest car in your neighborhood.” If nothing else, we are pretty sure you are going to have the only pumpkin spice-scented wheels in your neighborhood. Look, we’ll concede that pumpkin offers some positive health benefits for dogs and cats. That’s probably why it’s an ingredient in a lot of pet foods, though we’re really hoping tuna with pumpkin stays squarely in the cat food aisle (Hear that, Chicken of the Sea?!). But pumpkin spice? That’s a flavor your furry friends certainly wouldn’t be chowing down in the wild. Every October, pets are already on edge watching hordes of strangely dressed kids approach their homes, perhaps even ringing the doorbell. But some owners decide to compound the stress of the season by subjecting their cats and dogs to pumpkin spice products. 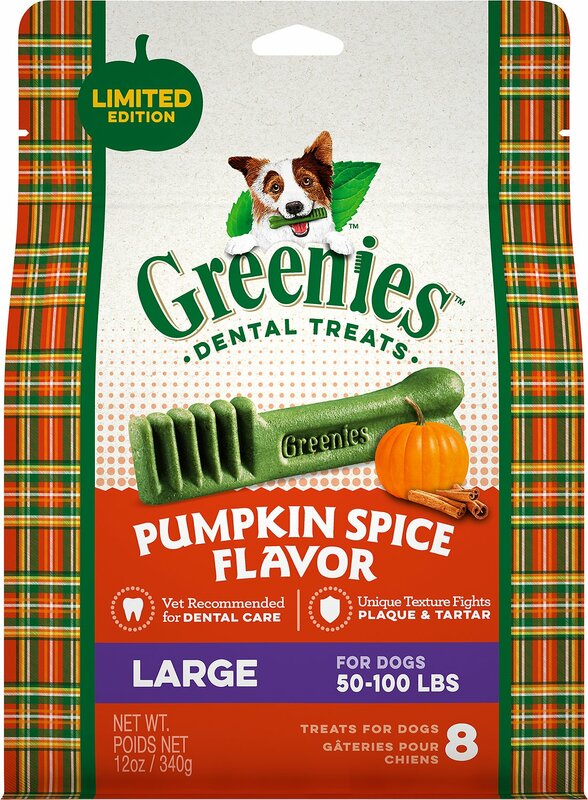 Greenies offers Pumpkin Spice Dog Treats. While the reviews are generally favorable (perhaps because several reviewers noted that the treats didn’t seem all that pumpkin spice-y? ), one dog parent notes the flavor, “was not his favorite but after he realized he wasn’t getting another one, he ate it.” Glowing! This is the same approach most humans use when they encounter, say, a Pumpkin Spice Werther’s Original in the office candy dish. But even the treats weren’t enough for humans who wanted their animal companions to have the full pumpkin spice experience. Enter the Pumpkin Spice Latte Mix for Dogs & Cats. While the reviews from most dog owners were positive, cats apparently were having no part of the seasonal offering (score one for cats! ), with one reviewer noting, “hungry feral cats walked away” when the pumpkin spice latte was put out. Ugh. Peeps. For a lot of us, the saving grace of these treacle-y sugar-encrusted marshmallow bird carcasses is that you only have to encounter them on store shelves, and perhaps Grandma’s house, once a year. But no, Peeps just couldn’t stay in their lane. (Easter, Peeps. Your lane is Easter.) 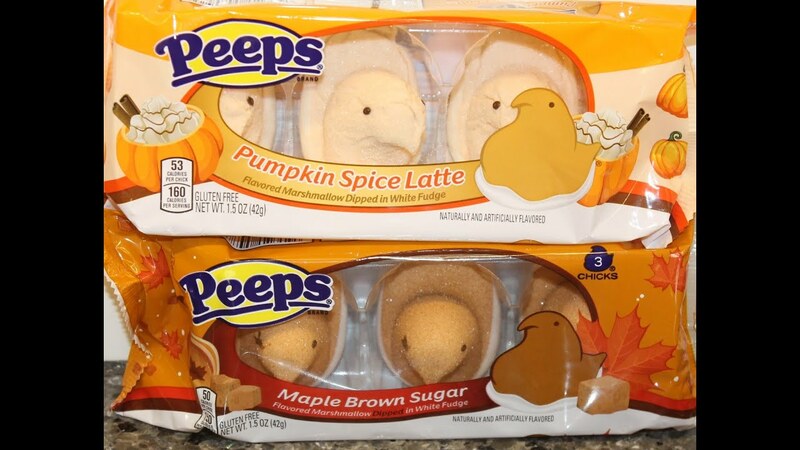 Now we have to confront a new incarnation of this sticky-sweet menace in the form of Pumpkin Spice Latte Peeps. Luckily these Peeps, which were also encrusted in white chocolate fudge (because apparently autumn is also the right season for diabetes), appear to have exited the market. In 2018, Peeps & Company didn’t include any pumpkin spice offerings in its seasonal lineup. Instead it stuck to “Marshmallow Monsters,” a name which is perhaps a bit too on-the-nose, and marshmallows that were merely pumpkin-shaped (which the company touted as “ideal for holiday recipes and crafts”). We’re just glad the pumpkin spice ones appear to be gone and that Peeps & Co. seems to realize that its products are perhaps better suited for crafting than eating. Hummus is trendy. Pumpkin spice is trendy. Put them together and you have some guests who will never again dive into an appetizer tray without first asking a lot of questions. Even though Cedar, which appears to be responsible for the original pumpkin spice hummus, seems to have removed its pumpkin spice hummus from its lineup, the genie was out of the bottle. Lantana, which prides itself on “challenging the hummus quo” (uhhhh, maybe don’t?) is offering Pumpkin Spice hummus, topped with cranberries and sunflower seeds. Because once you have put pumpkin spice in hummus, it’s open season on flavor innovation, baby. Lantana is also insisting that this combo is “your favorite fall flavor,” and if so, you’re a weirdo and we don’t want to know you. Walmart is offering its own pumpkin spice hummus, which one enthusiastic reviewer (who is demanding that her store “PLEASE have more in stock”) describes as, “ a sweet, almost dessert-like hummus.” Yep, that’s pretty much what we were picturing, but we’re not going to cry any pumpkin spice tears if we don’t see it on the shelves of our store any time soon. Yes, you read that right. And yes, our faith in humanity is a little shaken, too. 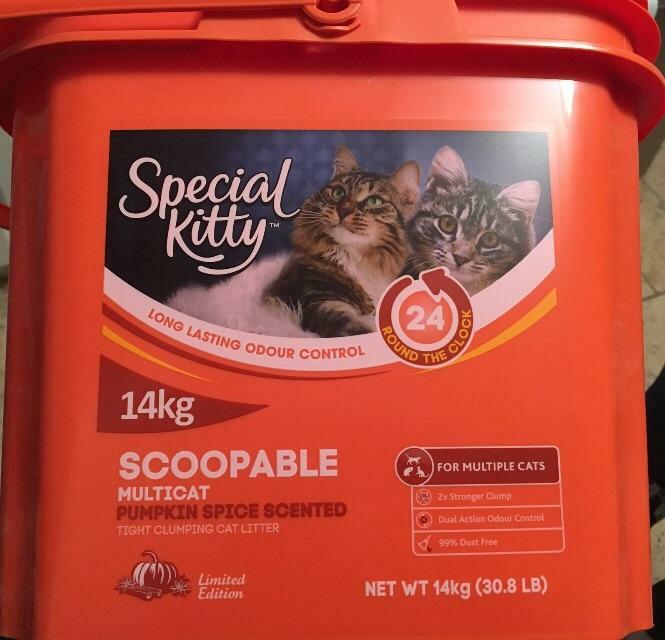 Walmart, under its Special Kitty brand, is offering pumpkin spice scoopable cat litter. As of fall 2018, it seems to only be available in Canada, where the retailer tells us it is a “Finalist for the Retail Council of Canada’s Canadian Grand Prix New Product Awards,” making us really question what the competing choices were (flaming dumpster? Lead paint?). While we do agree that many of these pumpkin spice spinoffs belong in the toilet, pumpkin spice cat litter seems to be taking it to a whole other level. Walmart Canada introduced its product saying, “You experience this flavor in your latte, smell the fragrance in your candles and air fresheners, and you can moisturize your skin with the scent of pumpkin spice so why not enjoy this fragrance when you clean out your fur baby’s litter box?” Why not? Because liking a seasonal latte doesn’t mean we want to scoop seasonal cat waste, Walmart! That’s why not. Tidy Cats briefly jumped on the seasonal litter bandwagon as well, offering a limited edition “Fall Frolic” litter, which offered the “welcoming aroma of autumn freshness… a light, woodsy scent reminiscent of an evening fall stroll.” Perhaps Tidy Cats realized that neither fall nor frolicking were something that consumers were interested in having in their cats’ litter boxes, because the product has been discontinued, going to the great pumpkin spice graveyard in the sky.